Maximum size: 30 mm (Gosliner, et. al, 2008). Identification: This species has a pale yellow mantle with white pustules and violet scallops along its margin. The rhinophores are brown with white lamellae and the gills are cream. The latter feature distinguishes it from the similar appearing Goniobranchus vibratus. Natural history: Goniobranchus albopustulosus is commonly seen on rocky bottoms from the low intertidal to 21 m (70 ft). It occurs in protected to exposed locations. It may also be found occasionally in Halimeda kanaloana beds. It is usually nocturnal but may be found under rocks during the day or resting in the open on shaded cliffs. It may feed on a cream sponge with yellow and rose undertones. (Note 1) The egg mass is pale orange-yellow. Distribution: Big Island, Maui, Oahu, Kauai, Niihau, Pearl & Hermes Reef and Kure: also known from the Marshall Islands. Taxonomic notes: Scott Johnson suggested on the Sea Slug Forum that Chromodoris aureopurpurea, Chromodoris alius, and Chromodoris rufomaculata might be synonyms of this species. The name refers to the white pustules. 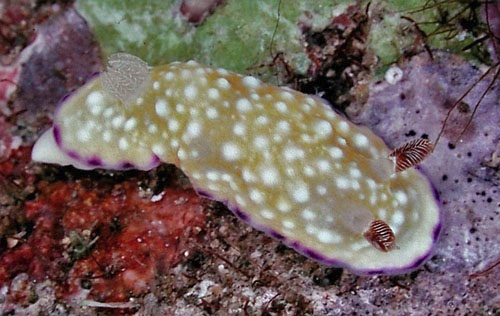 It's referred to as the "purple-edged nudibranch" in Hoover, 1998 and as the "white-bump nudibranch" in Hoover, 2006 while being listed as Chromodoris albopustulosa. It's also listed as C. albopustulosa in Bertsch & Johnson, 1981, Kay, 1979 and Kay & Young, 1969. It was first reported from Hawaii in Pease, 1860 (as Doris albopustulosa). Photo: PF: 16 mm: Makena, Maui; June 18, 1993. Note 1: The Oahu animals found with the sponge are in a posture typical of feeding. (see photos) But, the sponges show minimal damage leaving some uncertainty about the association.